The dollar yen currency pair is still trading in a very tight range, and yesterday was no exception, with a small up candle being formed. Interestingly, although the candle was relatively small, it has given us a bullish engulfing signal, with the body of the candle on Monday, engulfing that of Friday, so we may expect to see a rise in prices in the next few days, particularly when combined with the three doji candlesticks which preceded the signal.There is however, still the potential for a double bottom at 87.00, before prices move up to 91.00 and above and if we do see a break above 90.00 then prices could rise to this level and beyond in the short to medium term. 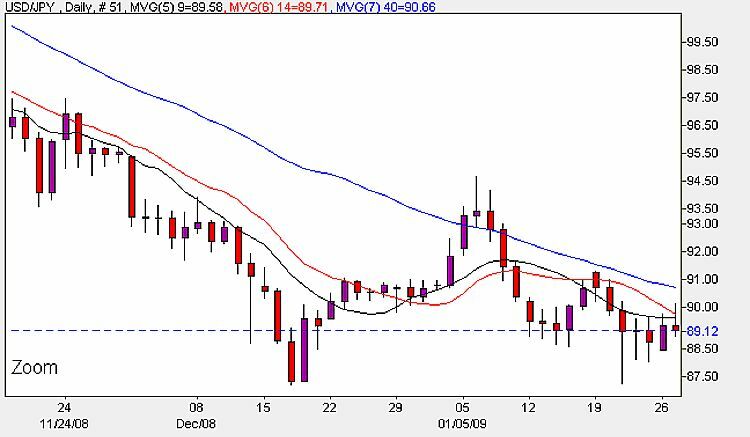 The strategy for intra day trading today is to buy at the 89.20 level, with a stop loss set below 87.20. The only fundamental news out today for the usd/jpy pair is the CB consumer confidence report due in the US at 1500 hrs UK time. This is a leading indicator of consumer confidence and should the actual exceed expectation then this will generally be positive for the US dollar.